Custom Orthotics and Braces Frequent Questions | Foot & Ankle Associates of Florida Will orthotics fix my child’s flat feet? As we look at whether or not orthotics fix flat feet, it is important to start by making a distinction between correcting a condition and treating symptoms. 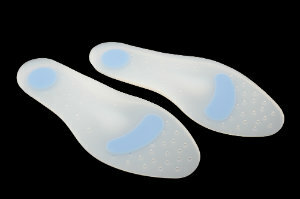 Orthotics will not improve arch height over time, thereby correcting the condition. Of course, the support these customized devices provide does relieve symptoms and are quite useful in this regard. One particular benefit of using an orthotic is to correct overpronation. Pronation is a completely natural inward rolling motion from heel to toe that feet use with every step. In the case of flat feet, this motion tends to be excessive (“overpronation”) and can potentially cause certain injuries. Custom-fitted orthotics can restrict this motion and prevent issues from developing by making sure forces are distributed across the foot as intended. Now, a consideration as to whether or not your son or daughter will benefit from a pair of customized orthotics is if pain is present. Not all cases of flatfoot cause pain. In these instances, we may simply want to monitor the condition and ensure problems do not develop. Call us at 407-339-7759 or 352-589-9550 (if calling from Lake County) for more information, or request an appointment with any of our five Florida offices online today.